Houston Dance (Meetup Group) - I had a Great Time Dancing Bachata with All of You! Hu M, leader of the group, is a phenomenal bachata dancer and great host. He made everyone feel so welcome and at ease. I had a great conversation with him about the group and how it has grown over the short period they have been together. I think it is his easy-going and high-spirited personality that keeps the group cheery and happy to get together. I also met, Jose and Jorge. Both incredible and inspiring people. Jorge is an architect under the guise of humility and class. He showed a quaint yet aspiring love for life. Jose is a joy to speak to. He is an inspirational individual with a drive for personal achievement and excellence! I cannot say enough about the way this group welcomed me into their circle. Among others, were Shawn, Dominica, Erwin, Natassja, and Sarah. Leaving no one out, the rest of the group was just as warm hearted. Having had a great time Friday night, I decided to give this group a second try on Sunday evening at Calabash Island Eats, a nice Caribbean fair in the heart of Downtown Houston. 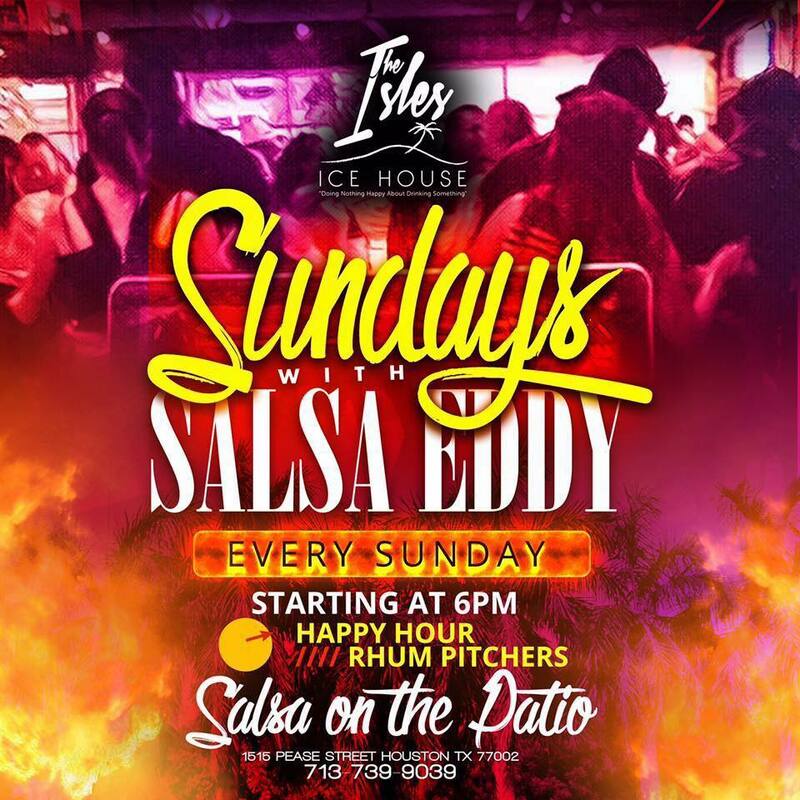 The music here was brought to you by none other than the great Salsa Eddy. The scene, though different than Cantina Laredo, was just as hype and happening. Again, Hu was great with everyone. I could tell off the bat this group is definitely made up of quality friendly people. I danced with other members of the group I hadn’t met. All the ladies were wonderful to dance with and very easy going. I was able to pick up the turns with ease. Of course, it took digging deep into my memory bank for some old-school turns as well as new ones I’ve picked up as of recent. As rusty I as I am, I was still able to hold my own against some of the pros on the dance floor. Nonetheless, it was a great time meeting and greeting new people. It was an easy crowd with a high propensity for the love of Bachata. Just unbelievable dancers on the dance floor!!! I also had the pleasure to dance with a lovely lady named Shirley. Wow! I was blown away by her mad salsa skills, and of course her bachata was off the hook. I really thought I wasn’t gonna finish the song when I was dancing with her. She kept me going for more. But as much as I tried to hide my inadequacies on the floor, I became easily tired when dancing with pros like her. Still, Shirley knew I wasn’t up to par and let me slip by unnoticed. Thank you Shirley! Great time dancing with you. Overall, I haven’t had a weekend like this one. Meeting these wonderful people was just one of the best experiences in the my recent past. I hope they will continue to allow me to join them in their outings. I guess I have a lot of work in getting back in shape and honing my bachata skills so I can keep up with the likes of Hu, Shirley and the rest. Thanks everyone for letting me jump in the middle of the dance floor with you. I had a great time and I hope to see you soon. What a nice description for our Meetup group. English/ESL Everyday is a fun way to improve our English skills, no matter the level, with different activities; it's free and open to everyone. Thank you Frasier, you're a great addition to our group. Glad to be here. Hopefully I'll see you guys at your next event. Have fun and keep me posted.